The Chattanooga Police Department says its officers could have body armor capable of resisting rifle bullets in as little as three weeks. "As far as our ability to defend ourselves aggressively, I do believe we are as prepared as we should be," Police Chief of Staff David Roddy told the City Council on Tuesday. "Now it's increasing our level of protection from the ambush-style of attacks that we are unfortunately seeing in our nation right now." According to projections, the police department will take 1,000 firearms off the streets this year, which include an increasing number of rifles, police Chief Fred Fletcher said. 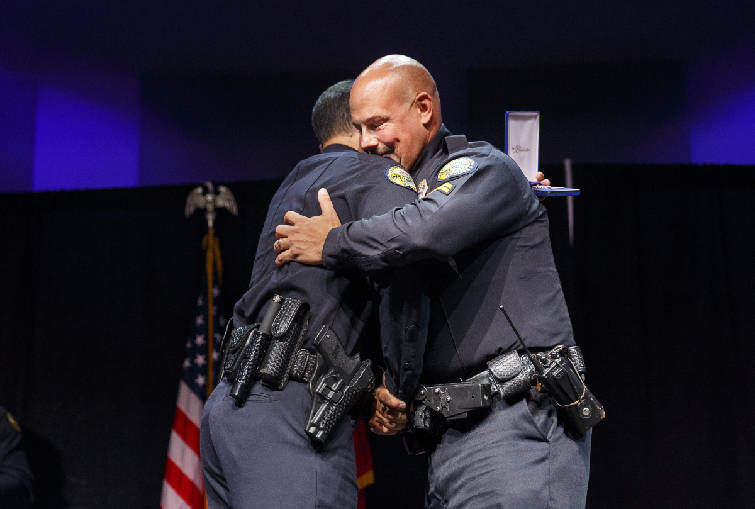 Chief Fred Fletcher, left, awards Officer Dennis Pedigo a purple heart during the Chattanooga Police Department's annual awards ceremony held at Calvary Chapel on Thursday, May 26, 2016, in Chattanooga, Tenn. Pedigo was awarded the medal after he was shot responding to the July 16, 2015, shootings at area military facilities. Except for specialized units such as the SWAT team, officers only wear protective vests resistant to smaller firearms, Fletcher said. The improved armor comes in the form of a heavy duty metal plate that inserts into current protective vests, Roddy said. "It basically raises the level of protection our body armor would give us relative to increased threats from rifle-grade ammunition," he said. To that end, the department requested — and the City Council approved in an 8-0 vote — the purchase of 500 body armor inserts for $109,000. The individual panels, which measure 7 inches by 9 inches, cost $200 each. "That's just great that we are supportive of this," City Council Vice Chairman Jerry Mitchell said. "It is very, very important for the safety of our police force." Following attacks targeting law enforcement officers in Dallas and Baton Rouge earlier this month, the Chattanooga Police Department implemented a new protocol requiring all officers to wear protective vests while on duty and interacting with the public, Roddy said. The community's response in the wake of those shootings, which left several officers dead, has been "enormous, almost overwhelming," Roddy said outside of City Council chambers. "The community has truly shown its love and support," Roddy said, citing numerous acts of kindness including people anonymously buying lunch for police officers and dropping off items at the department's service center. Councilman Yusuf Hakeem asked Roddy if police officers had the ability to handle extremely well-armed threats. "Looking around the nation, things that are happening. Are you equal, as far as firepower, with some of the things we see used against officers?" he asked. Roddy cited the police department's response to the July 16, 2015, attacks as an example of how well the department could deal with such as situation. During that event, Chattanooga "officers faced an individual who was about as armed and prepared as we would ever hope to expect on our streets," he said. He credited the police department's urban rifle program, which provides rifles to officers who request them to be carried in their vehicles. The City Council also voted 8-0 to approve a $50,000 request for security upgrades to the department's service center. Fletcher described the body armor and facility improvements as cost-effective best practices. "The community has said they want to protect those who protect [them]," Fletcher said. "People want us to make sure our public safety officers are safe." The money for the purchases come from within existing line items in the police department budget, Chattanooga Chief Operating Officer Maura Sullivan said.